Wednesday is always a strange day in the week - it's so far from a weekend isn't it! This week even more so for me as I missed last weekend as I had five very intensive days on campus from Friday til yesterday. I, like my fellow students, am shattered. My children have been lovely and for three days each cooked tea for the family, for which I am very grateful indeed. Wednesday - it's not only a long way from the weekends but today is cold, wet and windy. There are muddy puddles everywhere. The poor car drivers seem unable to avoid them as the huge brown waves break over us poor pedestrians. So where is the kindness today? Today... I think this counts: I made small talk with the exam invigilator who has the most boring job in the world. I took three skills tests today and in between we had some nice chats. I hope that made his day a bit more interesting - in turn I did feel less nervous, but he definitely was desperate to talk to someone! 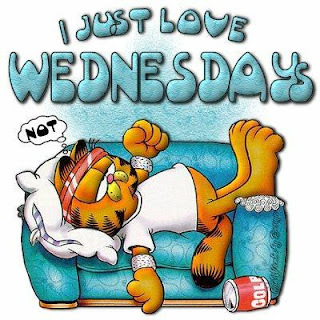 It's time to change how we think about Wednesdays - after lunchtime the weekend is getting closer isn't it!